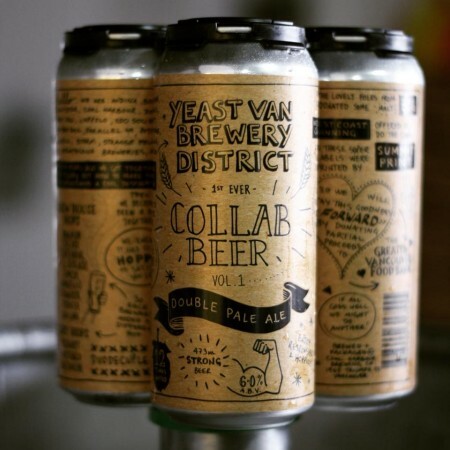 VANCOUVER, BC – A collective of breweries clustered in an East Vancouver neighbourhood that has become known as the Yeast Van Brewery District has announced the release of their first collaborative beer. Yeast Van Brewery District Collab Beer Vol. 1 (6% abv) is a double pale ale that was brewed at Coal Harbour Brewing with each of the other members – Andina, Bomber, Callister, Doan’s, East Van, Luppolo, Odd Society Spirits, Off the Rail, Parallel 49, Postmark, Powell, Storm, Strange Fellows & Strathcona – contributing a different type of hops to the recipe. Collab Beer Vol. 1 is available now at select private liquor stores and tasting rooms, with partial proceeds to be donated to the Greater Vancouver Food Bank.